Aug 8 3 THINGS TO SEND WITH YOUR COLLEGE FRESHMAN! Let’s talk sending your kid or step kid off to College this Fall! You've probably been inundated with lists out there of what to send with your College bound kid. Having sent three kids off recently, I found three key things missing from any of the dozens of lists. Three things, that I consider an absolute MUST for parent sanity when sending our youngins' off to forage on their own. When I was a kid, I always assumed when I grew up bullies wouldn't exist. The Internet shattered that fantasy with an all-new low for bullying; hate, intimidation, threats lobbed at victims from the safety of a cartoon character avatar and fake name. For a long time I chose to look the other way. It was "their" war not mine. Then I became a StepMom and like so many women before me became a Disposable Woman in the eyes of the Cyber Bullies. If ONLY Mom and Dad had stayed married........My life would have been PERFECT! Those words rolled off the lips of my step son Chris with such ease during his five year stay in our home. His parents had divorced when he was six years old and his Mother had firmly planted in his mind that a life of perfection had been snatched from him thanks to the divorce. And you remember who wanted the divorce? Right? May 31 WOULDN'T LIFE BE EASIER WITHOUT THE EX AROUND? It's a fantasy that we all at some point entertain even if we don't say it out loud - wouldn't life be better, easier if the Ex just wasn't around? No more back and forth, constant negotiation, different house rules, splitting life smack dab down the middle...... It's not that we wish for harm to fall upon the Ex - we just wish for simple, easy. But life is never simple or easy - Ex or no Ex in your life. If we didn't have the complications of a Blended Family to contend with - there inevitably would be something equally as challenging right there to take its place. My friends with families minus the Blended seem to have just as many issues as we do - just different issues - the key word being issues. Every family has issues. Its been years since I've been to the "What If" scenario. So when the phone rang with news that Greta, Mom to Jax and Little Hart, had suffered a heart attack - I felt guilty for ever having entertained the thought. Whether I'm 5 or 46 there's just sometimes when I need to hear THE VOICE OF MOM on the other end of the line. It could be that I have some fantastic news to share - devastating news or no news at all! 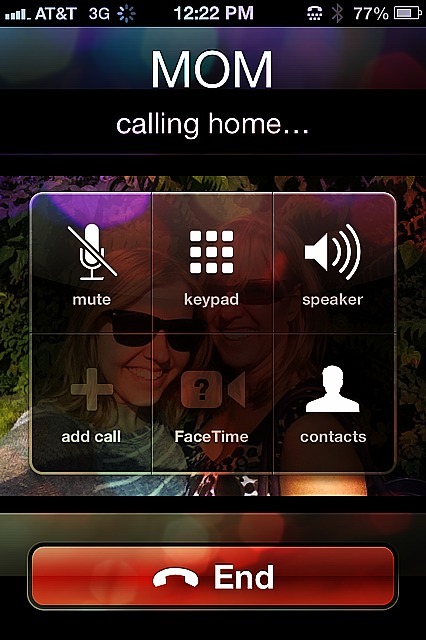 Mostly I take comfort in the fact that day or night I can call my Mom if I want and she'll answer! It's the same relationship I have with my daughter Elle. Five years ago - not so much! Immediately when I heard about the bombings in Boston - I felt a personal connection with my daughter living back East. I immediately called and texted Elle to "check in" - when she didn't pick up my heart started racing.